GENEVA (Reuters) - Russia won a dispute about "national security" at the World Trade Organization on Friday, in a ruling over a Ukrainian transit dispute that may also affect global automobile tariffs that could be imposed by U.S. President Donald Trump. 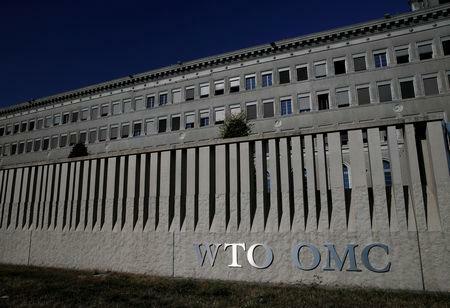 The WTO panel ruling, the first ever on the right to a national security exemption from the global trade rules, awarded Russia a legal victory because it had successfully invoked national security. Opponents of Trump's tariffs have ridiculed the White House's assertion that "economic security is national security" and have retaliated against U.S. steel and aluminium tariffs imposed in March last year, saying they are mere protectionism, with no link to national security. Trump is considering using the same legal basis for a 25 percent tariff on global imports of cars, which the WTO has said would be a bigger economic shock than the U.S.-China trade war. But in the past three years, Russia has cited it in the dispute with Ukraine, Trump has invoked it, and Bahrain, the United Arab Emirates and Saudi Arabia have cited it in a dispute with Qatar. Russia's Economy Ministry said that Friday's ruling had recognised Ukraine's arguments to be unfounded, and said the issue was of systemic importance for the WTO. Economy Minister Maxim Oreshkin said the ruling added weight to Russia's arguments against Trump's metals tariffs. The ruling can be challenged on appeal by Russia or Ukraine. The panel comprised Georges Abi-Saab, an Egyptian former head of the WTO's Appellate Body, Ichiro Araki, a Japanese expert on WTO law, and Mohammed Saeed, a Pakistani expert on customs and trade.